I wish you a very happy Friday morning! Today I would like to introduce another model musician who has been successfully involved in the music scene for several decades. Let us not forget that long before Paradis became known as “Lily-Rose Depp’s mom,” she was a child pop star at age 14 (her single “Joe Le Taxi” was a worldwide hit) who went on to act and become the face―and longtime muse―of Chanel. She’s remained dedicated to music throughout the decades, putting out six albums that have sold over 4 million copies in France. Vanessa Chantal Paradis; born 22 December 1972) is a French musician, singer, songwriter, actress and model. Vanessa Paradis was born in Saint-Maur-des-Fossés, France, to interior designers Corinne and André Paradis. She began to develop her singing career at age seven when her uncle, record producer Didier Pain, helped her appear on the local television program L’École des fans, a talent show for child singers. Paradis recorded her first single, “La Magie des surprises-parties”, in 1983 and performed it in an Italian festival in 1985. Although not a hit, it paved the way for the song with which she became internationally famous, “Joe le taxi“, in 1987 when she was 14. It was No. 1 in France for 11 weeks and, unusually for a song sung in French, was released in the United Kingdom, where it reached No. 3. It was taken from her first album M&J (it stands for Marilyn & John) which, although it placed 13th in France, drew little attention in the UK and did not enter the chart. In March 1989, at age 16, she left high school to pursue her singing career. Paradis released the album Variations sur le même t’aime in 1990, containing a remake of the Lou Reed song “Walk on the Wild Side“. The album was written by acclaimed French composer Serge Gainsbourg, whom she met when she received the best singer award at Les Victoires de la Musique, on 4 February 1990. In 1990, Paradis won the 1990 César Award for Most Promising Actress for her role in Noce Blanche. In 1992, Paradis moved to the United States to work with Lenny Kravitz, whom she also dated at the time. [ Paradis started working on a new album in English, a language she was now fluent in. Written and produced by Kravitz, the album, titled Vanessa Paradis, topped the French chart and briefly made the UK listings (number 45). One of the singles from it was “Be My Baby“, which made number 5 in France and gave her another Top 10 hit in the UK, peaking at No. 6. In March 1993, Paradis started her first international tour, the Natural High Tour; she performed in France, England and Canada. In February 1994, Live was released in France. In April 1994, Paradis filmed Élisa, under the direction of Jean Becker. Elisa was a big success in France, and was released internationally. In 1997, Paradis played in Un amour de sorcière with Jeanne Moreau and Jean Reno, before filming Une chance sur deux, with Alain Delon and Jean-Paul Belmondo. In March 1999, La fille sur le Pont, by Patrice Leconte was released. This movie was shot and released in black and white. In 2004, she promoted Chanel’s new handbags called Ligne Cambon. In 2005, she modeled for Chanel again for The New Mademoiselle handbag. In 2008, she modelled for Miu Miu. Meanwhile, she was included in the French children’s album and concert Le Soldat Rose in 2006. Paradis released a new album (Divinidylle) in 2007 which was released in the UK on 11 December (September in France). There are three versions (regular, limited edition, and the Christmas edition). She started the Divinidylle Tour in October. Some concerts were filmed and a DVD/CD of the tour was released. Paradis won two ‘Les Victoires de la Musique’ awards for this album in February 2008. Some of her later projects are a greatest hits CD (Best of Vanessa Paradis), which includes the commercial jingle “I love Paris in the Springtime”; she also starred in the animated film Un monstre à Paris, released in 2010. Canadian film director Jean-Marc Vallée cast Paradis in a starring role in his film Café de Flore, in which she plays the single mother of a Down syndrome child in the 1960s. The film was released in 2011, and Paradis garnered a Genie Award for Best Actress in a Leading Role at the 2012 Genie Awards. Paradis released an acoustic album in November 2010 entitled Une nuit à Versailles. The album was recorded at L’Opéra of the Palace of Versailles during her Vanessa Paradis Concert Acoustique Tour. She also released a set of DVDs in 2010 called Anthologie which collected rare live performances and interviews from 1987–2007. In 2010 she became the face of Chanel‘s new lipstick, Rouge Coco. She also became the face of their new handbag line, Ranger. Her 2011 international tour included performances in the United States, Canada, the United Kingdom, Europe and Turkey. 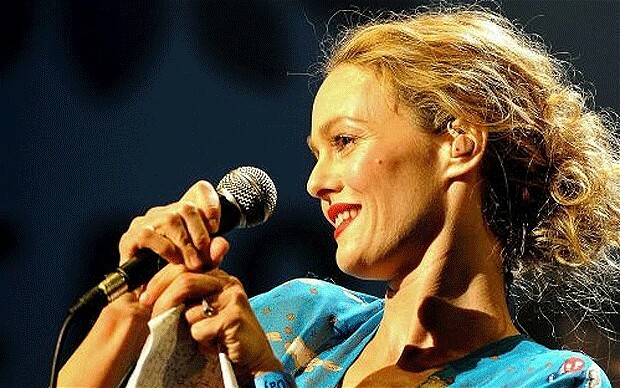 In May 2013, Vanessa Paradis released a new album, Love Songs, a double LP produced by French singer and producer Benjamin Biolay. The first single, Love Song, was also written by Biolay. The second single was Les espaces et les sentiments. The third single, Mi Amor, was written by BB Brunes frontman Adrien Gallo. Other people that have contributed to the songwriting of the album include Mickey 3D frontman Mickaël Furnon, Johnny Depp, Paradis herself and their daughter Lily-Rose. In 2016, Paradis starred in Yoga Hosers with her daughter Lily Rose, as a history teacher. That same year, she was a member of the main competition jury of the 2016 Cannes Film Festival. Before listening to some music samples, let’s take a look at Vanessa’s work as a model in a clip from FashionTV, the world’s most important medium for fashion & lifestyle. And here´s Johnny Depp on guitar with Vanessa Paradis. I want to finish my story of today with Vanessa Paradis and Johnny Depp in a video about their love story. I wish you a successful Friday and come back tomorrow with the legend NAOMI CAMPBELL.